Wayne Baines attacked a man in the American Chicken takeaway in Market Street, Chorley. He will be sentenced on November 5, 2015. A jealous thug who bragged on social media after slashing a love rival with a kitchen knife has failed to convince top judges he acted in self defence. 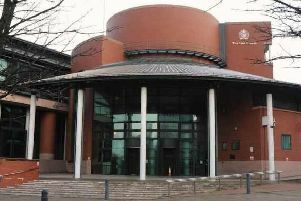 Wayne Anthony Baines was sent packing by the Court of Appeal – and was ordered to serve four extra weeks behind bars for wasting judges’ time. Baines (pictured) of Tulketh Road, Ashton on Ribble, Preston, was caged for 10 years at Preston Crown Court in November 2015. Jurors convicted him of wounding with intent and attempted intimidation. He pleaded guilty to breaching a restraining order, but was cleared of attempted murder. Condemned as a dangerous offender, Baines was also ordered to serve five extra years on licence following his release. Baines, 25, attacked his victim at the American Chicken and Pizza Takeaway, in Market Street, Chorley, in October 2014. He had a grudge against his victim because he was involved with Baines’ ex, London’s Appeal Court heard. He argued that the jury was given insufficient detail about the medical evidence and the “mechanics of the incident”. But Mrs Justice Cheema-Grubb ruled the jury had all the evidence it needed to find him guilty. The judge, sitting with Lord Justice Burnett and Mrs Justice Carr, said Baines had been warned in advance not to pursue an “unmeritorious application”.